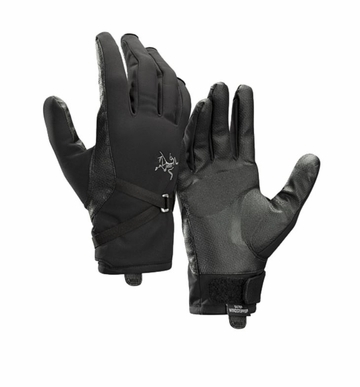 Highly dexterous GORE® WINDSTOPPER® glove ideal for ice and alpine routes. Designed to deliver maximum dexterity and tactile control while climbing, the Alpha MX Glove provides GORE® WINDSTOPPER® weather and thermal protection on rock, ice and alpine routes. The palm’s synthetic material holds tight in wet or dry conditions, the fit helps eliminate shear on tools or rock, and the adjustment system leverages a pulley for a stable, secure fit. The next-to-skin fit provides exceptional feel, and additional thermal protection at the knuckles adds light warmth. Alpha: Lightweight, minimalist climbing and alpinism products that protect from alpine environments. Mixed Weather: Highly durable, breathable and mobile. Best for mixed usage in changing weather conditions. Alpinism and Climbing: Climbing equipment designed for efficient movement and protection in alpine environments. Windproof Material: Impervious to wind and offers significant weather resistance with lighter weight protection.